Phong Nha-Ke Bang National Park is in Quảng Bình Province, in the north of the Central Coast region of Vietnam. Designated a Unesco World Heritage site in 2003, and with its inclusion as a filming location of Kong: Skull Island, Phong Nha has now become renowned as one of the most beautiful and interesting areas of Vietnam. With the opening of Danang International Airport, tourism in the area is booming, and the choice of transport, eateries, accommodation and tours improves. Coming to Phong Nha really does provide a chance to get out in the real Vietnam on a bicycle Cycle the Kong jungles or walking and soak it up. The remarkable Phong Nha-Ke Bang National Park contains the oldest karst mountains in Asia, formed approximately 400 million years ago. Riddled with hundreds of cave systems – many of extraordinary scale and length – and spectacular underground rivers, Phong Nha is a speleologists’ heaven on earth. Sơn Đoòng Cave 'cave of the mountain river' or 'mountain cave of Đoòng [village]' in Vietnamese, is a solutional cave in Phong Nha-Kẻ Bàng National Park, Bố Trạch District, Quảng Bình Province, Vietnam. As of 2009, it is the largest known cave passage cross-section in the world, so huge that it has its own jungle, large, fast-flowing subterranean river and climate. Travel is difficult due to its location near the Laos–Vietnam border hence it is preferable to go with seasoned travel agents . It was formed in Carboniferous/Permian limestone. Weather in Phong Nha Ke Bang is a typical type of weather in North Central Coast. The average annual temperature ranges from 23 to 25 degrees Celsius. The average temperature between months fluctuates greatly, highest in July (above 29 °C), lowest in January (17 °C). The coldest weather is from December to February. The hottest weather of the year is in June, July and August with an average temperature of 28 °C. Phong Nha Ke Bang is a large area of limestone, thus, the temperature gap between day and night is big. Especially in summer days, the temperature range is above 10 degrees Celsius. In winter, the figure is still over 8 degrees Celsius. Phong Nha Ke Bang is located in North Central Vietnam with high precipitation (from 2000 to 2500mm). As it is near the Vietnam-Laos border, the rainfall level reaches up to 3000mm per year. September, October and November are the rainiest months in a year. The total precipitation in rainy season is extremely high, accounting for 88% of the annual rainfall. There are about 135 rainy days in coastal area, while there are about 160 rainy days in mountainous area. The frequency of rainfall accounts for about 20%, and focuses on September and October. Great erosion and flooding usually occur at this time. In dry season, despite low rainfall, the average monthly number of rainy days is at least 10 days. The evaporation is quite high, varying from 1000 to 1300 mm / year. The humidity is moderate (83-84%). In dry season, humidity is much lower (as low as 66-68%), even down to 28% in some days. This is the day when Foehn wind blows from Laos, causing very dry and hot weather. Currently, the closest service is via Vietnam Airlines to Dong Hoi, check their website for latest fares and flight times. Several arrivals and departures at Dong Hoi daily from as far away as Hanoi and Ho Chi Minh City, only a few hours from Hue. 6 hrs from Da Nang. Many options exist for travel to and from Phong Nha via bus. Busses depart from Dong Hoi, Hanoi, Hue, Cat Ba, Danang, Ninh Binh and many other smaller destinations. Ninh Binh ---> Cat Ba: 7.40 and 13.00, you can get the bus from Phong Nha which normally arrive at 6.00 - 7.00 am then connecting the bus to get to Cat Ba. The Phong Nha-Dong Hoi bus leaves from a bus office that is close to Beachside Backpackers in Dong Hoi. It goes south along Truong Phap street, past Beachside Backpackers and and then along Nguyen Du Street. The bus turns right in to Tran Hung Dao street before turning right on To Huu street to get the Ben Xe Nam Ly (Nam Ly Bus Station). you can easily find it on Google Maps, but it's not on the latest version of maps.me. The bus then passes the airport on The AH1 before making for Phong Nha via Hoan Lao. The bus takes about an hour and a half from the office to Phong Nha. The bus stops at a blue and white bus stop signs along the route that have a white bus picture and say Dong Hoi - Hoan Lao - Phong Nha. This includes the stop opposite Ben Xe Nam Ly (Nam Ly Bus Station). The bus is a green and yellow bus, the bus name is Ngoc Anh and says Dong Hoi-Phong Nha across the windscreen. The bus departs from Dong Hoi at 05h30, 06h00 and then every hour until 17h00, so leaves the Nam Ly bus station about 15 minutes after it starts in Dong Hoi (usually about quarter past the hour) , but this depends on passengers and traffic. Many companies now offer motorbike/scooter rental in Phong Nha. When choosing a rental company you should take in to consideration the cost, maintenance of the motorbike, quality of the helmet supplied and breakdown/rescue services in case you have a problem. It is recommended that you spend a couple of dollars more to get a good motorbike from a reputable rental rather than getting the cheapest motorbike. The National Park has some spectacular caves an scenery, but the roads are narrow and winding in places. Please ensure that you have sufficient riding experience to take on the remote landscape of the park before renting a motorbike. If you do not have experience riding a motorbike, you can arrange for an easy rider from the Easy Tiger Hostel. This provides employment for local people, a safe licenced driver who knows his way around, and gives you the opportunity to enjoy the scenery more than if you were driving and navigating for yourself. Motorbikes can also be rented for 150,000 to 250,000VND from hotels in Dong Hoi. It takes about 1 hour via the Ho Chi Minh highway. The Phong Nha cave is about 45 km from Dong Hoi and the Thien Duong (Paradise) Cave is about 70 km from Dong Hoi. Pickups from Airport, Train Station, or Tourist and Local Buses to and from Ha Noi can be arranged for around 500,000VND through the reputable hotels and accommodations in Son Trach (Phong Nha) and Cu Nam. Taxis can be hired from hotels/resorts, airport or train station in Dong Hoi. About 1 hour on the Ho Chi Minh highway with cars, oxcarts, motorbikes, buses, trucks. Tours are available from both Easy Tiger Hostel at Phong Nha and Phong Nha Farmstay in Cu Nam. Hotels in Dong Hoi can arrange day trips to the park but best to stay in Phong Nha as Dong Hoi is 50km away. There is no fee to visit the Phong Nha National Park and the roads are open to all. There are a couple of ex military checkpoints along the ‘ring road’ from Phong Nha town to the Paradise Cave and back again, but these are just for show and serve no purpose, even if they are manned. You simply get waved through. These is however a charge for all the attractions collected on site. Motorbikes can be rented in Phong Nha for 150,000 as of February 2017. Everyone was totally unwilling to negotiate at all. All bikes were Yamaha Nouvos, unanimously in poor condition. One full tank of gas on a motorbike does seem to be sufficient to make the loop from Phong Nha, through the countryside, to Discovery Cave, and then back through the national park. The National Park was opened to the public in 2010 and consists of pristine untouched jungle spread throughout a rugged landscape. The area is full of large cave systems, the most famous being the Son Doong, Paradise Cave, Hang En and Phong Nha Cave. An 2013 it was announced that tours to the largest cave in the world, Hang Son Doong, would be opened to tourism in 2014. Oxalis Adventure Tours ran pilot tours in August 2013, and commenced operations in January 2014 with a six day exploration costing 3000USD per person. In 2015 the tour was reduced to 5 days in the caves but the price was retained at 3000USD per person. The Phong Nha Ke Bang National Park is not very 'open' as yet. The area is close to the Laos Border, the military has a presence within the park, and the park has one of the highest concentrations of unexploded ordinance (bombs) in the world. Currently, you are not allowed to hike or trek through the park without a licensed tour operator, and most of the hiking is found as part of caving expeditions, such as to Hang En. There are 2 roads that travel through the park, the Ho Chi Minh West Highway, and Highway 20 (otherwise known as 'Victory Road'), and these create a loop which can be travelled by motorbike or on a tour. Phong Nha and Tien Son Caves: As of July 2015 prices have nearly doubled It costs 150,000 VND to visit the Phong Nha cave and 80,000 VND to visit the Tien Son cave and 320,000 VND to rent a boat for up to 14 people to visit one or 350,000 for both. You can share a boat with other tourists that show up. Renting a boat is a requirement as there is no other way to get to the caves. Caves are exquisite and very large. It is about 45 km by road from Dong Hoi and takes about an hour by motorbike. Or call direction to Phong Nha tourism (tourism manage organization) to book the ticket:  [Dec 2018] You can also take the public bus B4 from Dong Hoi, it passes every 40-60 minutes, and the trip takes about 1-1.5 hours. Double check with your hostel. For the way back this traveler was picked up by a van on the bus stop, more express, same price. Nuoc Mooc Spring Eco Trail: 80,000 VND for ticket (March 2015). Transportation can be negotiated to take you there from Phong Nha village. Buy ticket at the hut under the sign off the road, then wander the bamboo bridges and paths along both sides of the river/rapids. Go back to see where the river springs up out of the ground. This is also on the road to the Thien Duong (Paradise) Cave. Thien Duong (Paradise) Cave: Newly paved road off the main HCM Highway provides car/motorbike/bus access. Buy 250,000 VND (March 2015) ticket to enter; the fee includes an English speaking guide. Just after that, separate >>optional<< ticket for non-polluting electric golf cart to the base of the stairs (if nice weather, walk along the new path of about 1.6 km instead). Approx. 500 stairs up to entrance of cave, another 100-200 stairs down inside. Stunning, tastefully lit cave features along 1.1 km of new (spring 2011) wooden pathways. It is about 70 km by road from Dong Hoi and takes about an hour and a half by motorbike, or around 30 minutes if you are staying in Phong Nha. Some claim that this is among the most beautiful caves in the world. Hang Son Doong is the world's biggest cave, discovered as recently as 2009. A cave so big that a whole Manhattan city block, skyscrapers and all, could fit inside of it. Tours started in 2014 and numbers are restricted to only 10 tourists/week during the caving season from February to late August. Ruc Mon Cave was just discovered in 2016 by a local man, this cave has the potential to be the 2nd biggest cave in the world. The first tourists experienced this cave in 2017. Right now only one tour company offers access to each of the cave's two entrances. The tours are led by the man who discovered the cave and spent 2 years exploring it. The Phong Nha - Ke Bang Tourism Center has tours to visit the caves that are similar to the ones offered by Farmstay, but cheaper if you go on a group. However, joining an existent group won't get you a discount. You can book them online or directly at the center, at the bend in the main road of Phong Nha, next to the market. Dark Cave 350.000 VND. Cave that you explore with headlamps, as it's not illuminated, whose main attraction is to be filled with mud. You follow a narrow passageway that leads to a mud pool, where you can lay down without sinking. It's silly, but fun. You zipline to the entrance of the cave, then return kayaking, and do a zipline jump into the river. They have lockers at the entrance, so you can leave all your clothes there and go into the cave just in your swimsuit. With the souvenir shop at Phong Nha tourism center, the guest can get handicrafts, brocades, stones, bead products, bamboo and rattan products (rattan baskets, traditional conical hat ...), seafood (dried shrimp, dried squid, dried fish) Herbs, wide Honey. And local market is located front of the Center for guest have the time to walking visiting. The newly opened CAPTURE VIETNAM coffee shop, restaurant and shop is a great place to pick up imported goods and travel essentials. Capture stocks many items that cannot be found anywhere else between Hue and Hanoi, including sunscreen, insect repellent, tampons, condoms, imported sweets and chocolates, home made cakes, bread and ice cream and many other interesting things. Located next to Easy Tiger, the air conditioned coffee shop is a haven from the heat and a great place to shop, eat, drink coffee and relax. In Dong Hoi, there is a range of hotels/guesthouses, as well as at least one beach resort. About 1 hour travel time from Dong Hoi to the park. Chay Lap  - Please see their website as they make it very clear that they only allow package tours at their hotel. No independent travelers allowed and they will not book you a room unless you go through one of several pre-selected and expensive packaged tour providers. In Phong Nha Town near the cave boat dock there are several budget level guesthouses along the road TL20 (intersection with the giant sign that says Phong Nha Ka Be National Park) for around 150,000 dong or more. Trang An Hotel Two star hotel found right before the entrance into the national park area with a bright neon light visible from the HCM Trail at night. Wifi is free. Doubles with private bathroom, air conditioning and fridge for 350,000 dong. Check park regulations first, or go with an organized tour. Park rangers are very suspicious of undocumented visitors overnighting in the park. Camping may now be available at the botanic gardens, but this is unconfirmed. Be cautious driving on the road to/from Dong Hoi; avoid night driving. 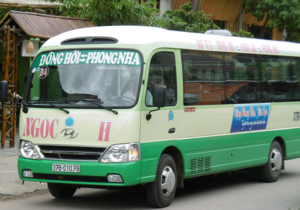 There are regular tourist buses either to Hué, Hoi An or Hanoi. By Motorbike: If the weather is good (and only then!) do consider the route to Khe Sanh. It is a 230km ride along the Ho Chi Minh Highway with the most stunning views and almost no traffic. Be aware that there is almost nothing in between. The first place to buy Gas is at Kilometer 82 and it comes with a very steep price (40000 Dong per liter). You will probably get to Khe Sanh on a full tank with a Honda Win but don't gamble. There are some smaller pubs and places to eat along the road but especially if the weather is warm make sure you have enough water with you. Also be aware that the weather can easily change, that you will take a lot of time, especially as you will feel the need to stop every few kilometers to shoot photos. So leave early and don't push it too hard. There are some places to stay in Khe Sanh. You can request a taxi from your hotel from Phong Nha to Dong Hoi. The rate was 500,000 dong, payable to the hotel, and non-negotiable. This page was last edited on 23 December 2018, at 09:32.